Sherwood goes from strength to strength and in Rikshaw they have a new style of Indian restaurant. Street food, particularly Indian, does seem to be flavour of the month with Karobar and Mowgli recently opened in Nottingham centre. There is also talk of Zindya coming to the city too. The concept does set itself apart from the traditional Indian restaurant, the menu much less dominated by curry the most obvious difference. Instead there are smaller dishes, grills and chapatti rolls. There is also a strong selection for both vegetarians and vegans. 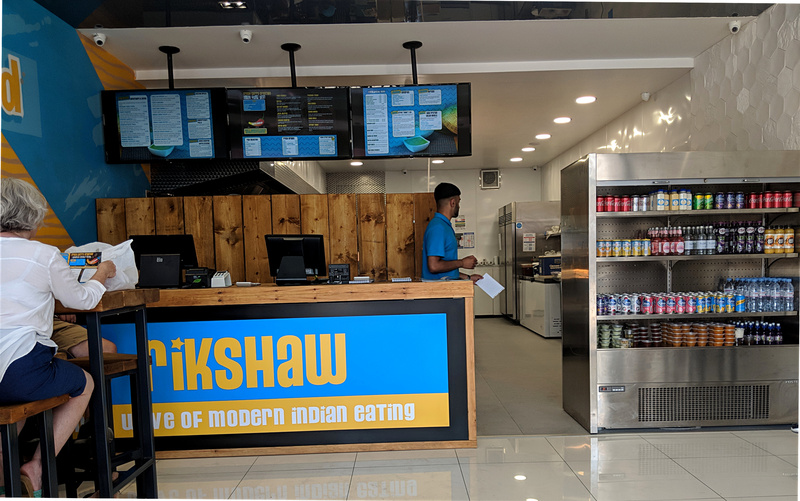 The Rikshaw restaurant/shop itself is bright and shiny amongst a dull backdrop of charity shops on Mansfield Road. Inside there are just a few tables as the majority of their business is in the takeaway market. The space is a touch clinical with a white tiled floor and brushed steel cooler – definitely function over fashion. Flashes of their bright blue and yellow branding brighten the space. I did feel it had a similar problem to Tamatanga in that I find Rikshaw a little hard to love with its polished branding. They say they already have designs on other locations which doesn’t create that local connection that other independent restaurants might. Since it opened I have had 4 meals at Rikshaw, eating in once, so have had the opportunity to try several dishes. Despite this the menu is large enough that there is plenty I have yet to try. From what I have eaten a couple of favourite dishes have definitely emerged. Their pakoras (3 for £2.95) have always been seriously crispy with a good punch of spice and underlying heat. They’re good enough that I can enjoy them without chutney though their mint one is the best pairing for these. 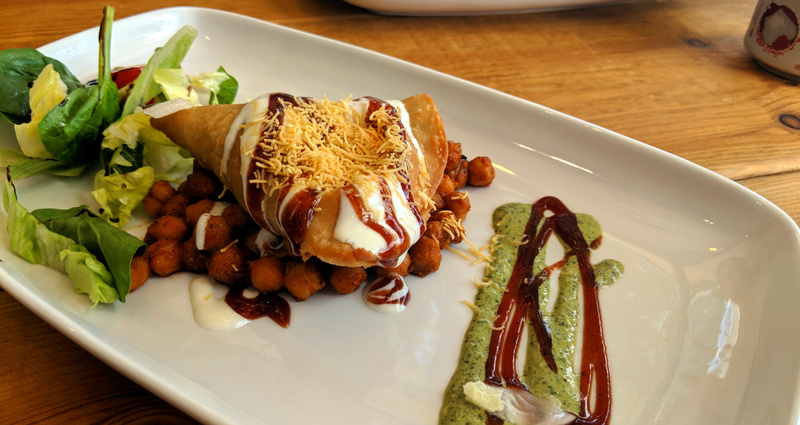 Chaat’s are another dish we’ve enjoyed on a few occasions there are different versions but it boils down a base of potato and/or chickpeas alongside some crispy stuff with tamarind chutney, yoghurt and fresh coriander. Both the samosa (£4.50) and papdi (£3.95) versions here are well made, the tangy tamarind sauce making all the difference. If you take away you’ll have to assemble yourself to avoid it looking its crispness in transit. Eating in on the other hand does at least provide proper plates which will please many. You do have to deal more with the token salad that is oddly served with balsamic dressing. The meat dishes have impressed somewhat less. Urban lamb chops (4 for £4.95) were sadly tough, spicing good but not as good punchy as it could have been. Similarly Urban Lamb Patties (2 for £4.95) were a little dry and other than a general saltiness didn’t deliver in either being fragrant or spicy. Much chutney was needed to get through them. Something that pleasingly missing the “Urban” moniker was their Chilli Chicken (£4.95). It was also the best of the meat dishes I have had, the sauce an Indo-Chinese mix with the chicken being coated in a light batter. As a result the flavour is probably closer to that of Chinese food but its always a dish I’ve enjoyed. This version suffered slightly from a flabby batter but was one I would order again. My experiences at Rikshaw are tough to summarise having such good, and such disappointing food in the same meals. One consistent positive is that you can eat well with 2 or even 3 dishes and be full for less than £10 which is increasingly rare, one of their £5 wraps would be plenty for lunch for most people. With recent weather it also satisfies ones craving for Indian food but with lighter dishes. That said, if you aren’t around the Sherwood area and can’t get a takeaway it might not quite qualify for a special trip to eat in. Personally I am likely to return due to the variety of the menu and value that’s on offer, despite a few disappointments. How can we make the portions smaller but still charge the same?